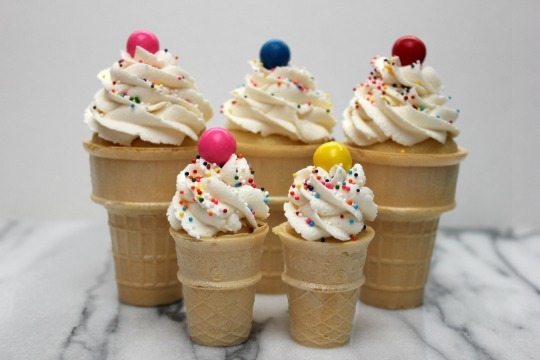 Our daughter is 19 years old and ice cream cone cupcakes are still one of her favorite desserts. I'll have to admit - they are pretty cute and tasty too! I haven't made them forever, but after seeing them on Love from the Oven a few weeks ago, I thought I would surprise Madison and have some ready when she came home from lifeguard duty at the pool. My aunt gave me about a hundred of these mini size cones last summer. Place cones into a muffin pan. Prepare cupcake batter as directed on box. Do not fill them too much or they will overflow and you will have a BIG mess! Gently place the muffin pan into the oven. Bake for 18-20 minutes or until done. In the bowl of your stand mixer add butter and beat for about 1 minute. Add confectioners sugar one cup at a time. Add creamer and vanilla extract and beat until light and fluffy, about 4-5 minutes. Place frosting into a piping bag. I use a Wilton 1M tip. 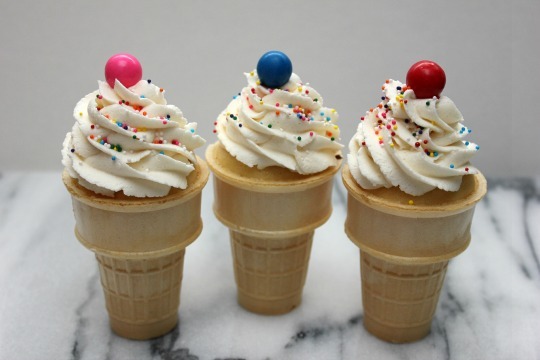 Note - Ice Cream Cone Cupcakes are best if served the same day you make them. The cones soften when left over night. I cant believe I have never made these. They are darling!